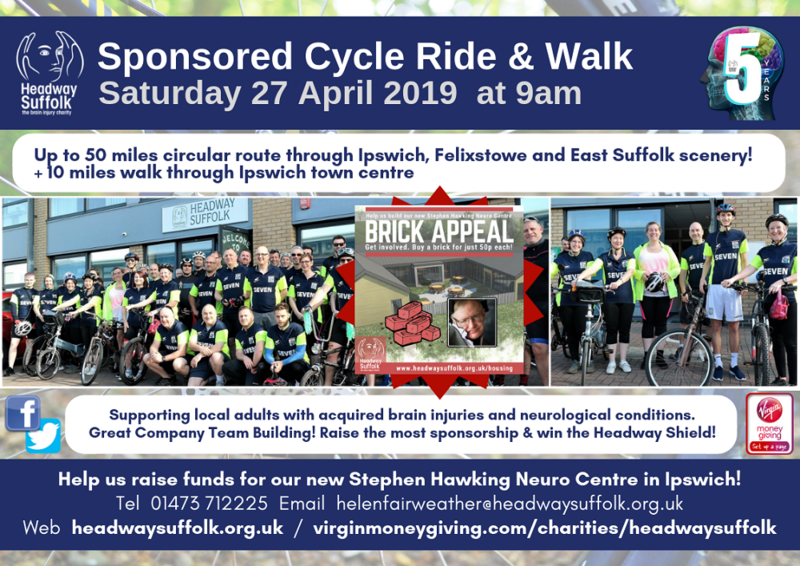 Brain injury charity Headway Suffolk is marking its fifth anniversary year by hosting three fundraising events in spring to help improve its services for local people. Headway Suffolk was formed on 1 April 2014 following the merger of East and West Suffolk, and since then its rehabilitation, therapy and support services for local adults with acquired brain injuries and neurological conditions have gone from strength to strength. The charity helps service users rebuild lost skills, improve confidence and increase social integration at its hubs throughout Suffolk, as well as providing support to individuals in their own home and local community. Headway Suffolk is embarking on ambitious plans to build the Professor Stephen Hawking Neuro Centre – a new rehabilitation hub and housing centre in Ipswich for those with brain injuries and neurological conditions. Supporters can get involved in helping the exciting new build by taking part in its fundraising events in spring, where all details can be found at www.headwaysuffolk.org.uk/events. 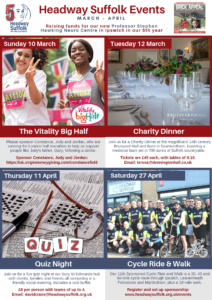 The Cycle Ride and Walk, which has raised £50,000 for the charity, takes place for the 11th year on Saturday 27 April at 9am at Epsilon House in West Road, Ipswich. The flagship fundraiser comprises 30, 40 and 50-mile cycle routes through Ipswich, Leavenheath, Felixstowe and Martlesham, with a new and improved 10-mile route for walkers. It’s just £10 to participate unless you have sponsorship. It is open to everyone and is an ideal team-building exercise for companies to compete to win the Headway Shield by raising the most sponsorship. To enquire further, email helenmfairweather@headwaysuffolk.org.uk. 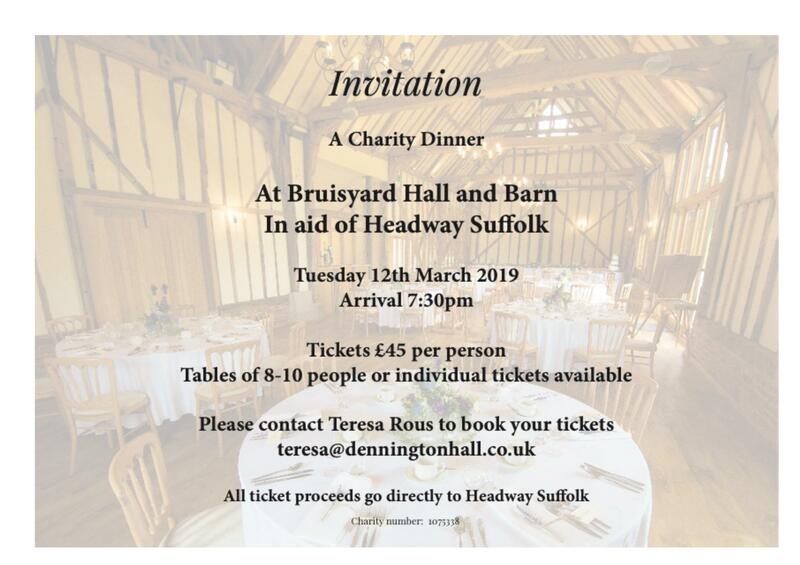 Before then, Headway Suffolk is inviting corporates to a charity dinner on Tuesday 12 March at 7.30pm at Bruisyard Hall and Barn, near Saxmundham, which is a magnificent country house with a beautifully refurbished medieval barn set in 700 acres of quintessential Suffolk countryside. Tickets are £45 per person, with tables of eight to ten people. To book, contact Teresa Rous by email at teresa@denningtonhall.co.uk. 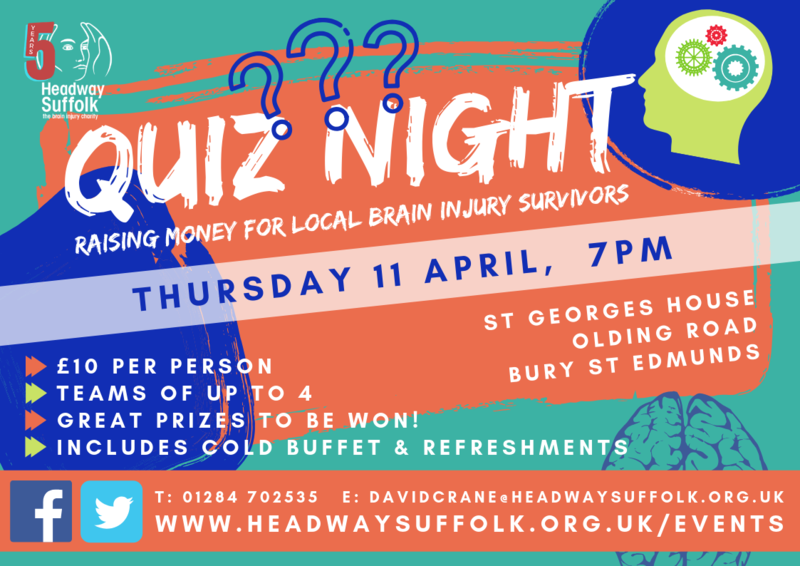 On Thursday 11 April at 7pm, Headway Suffolk is holding a quiz night at its Bury St Edmunds hub at St Georges House in Olding Road. It will be a perfect opportunity for a friendly social gathering of clients, volunteers, staff, families, friends and supporters. It costs £10 per person, which includes a cold buffet and refreshments, with teams of up to four people. To book your place, contact David on 01284 702535 or email davidcrane@headwaysuffolk.org.uk. David Crane, the charity’s communications and marketing officer, said: “2019 is a big year for Headway Suffolk as we celebrate our fifth anniversary year, as well as continuing our big plans to build the Professor Stephen Hawking Neuro Centre in Ipswich, which is due to open next year. For full information on its events, go to www.headwaysuffolk.org.uk/events. This article was posted in Front Page. Bookmark the permalink.